Summer is right around the corner and as those temperatures start climbing, you’ll probably be thinking about the best way to beat the heat. Air conditioning makes a world of difference during those hot months. But what’s the best way to go about it? The two main options are window AC units and HVAC systems. So, let’s take a look at the pros and cons of window AC units to see if they are the right fit for your home. Many people enjoy window AC units because they are generally inexpensive and easy to install. They are a lot like electric wall heaters in this regard because, in some cases, you can purchase and install one for a small room for a little over $150. They are flexible too, as you can install them in transoms, single and double windows, and other places. 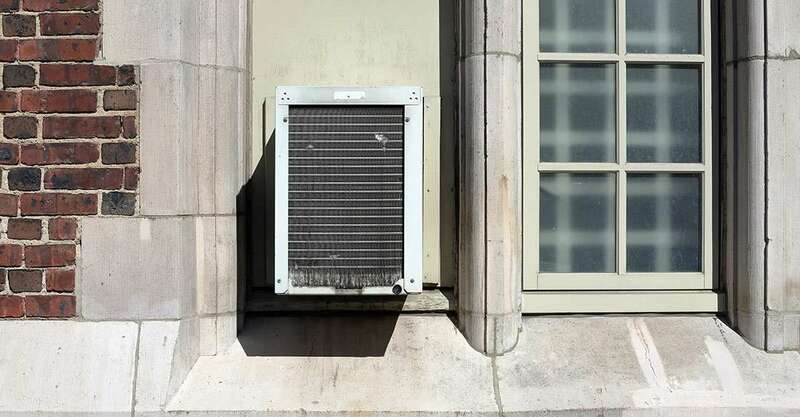 In general, they are good temporary solutions, generally for renters in places where landlords aren’t interested in investing in an HVAC system. Window AC Units can’t be installed just anywhere. The window frame needs to be able to bear the weight of the system and it’s important to consider the exposure of cables and electricity to outside moisture when choosing where to place the unit. AC units also completely block whichever window you choose to install them in, which means you can’t open the window to get fresh air or natural light into your home. Window AC units are also not at all energy efficient for larger homes. They are fine for a small room, but they have trouble cooling entire apartments or houses. When you’ve got a bigger space, you’ll need multiple units to keep your house cool. This not only increases your upfront cost but also radically increases your energy consumption. On top of these cons, there’s also plenty of tales about window AC units falling down several stories crashing to their deaths. Plus, they can also be a security risk, as they are easy to rip out, giving thieves an easy way to get into your home. The most important factor to determine which type of system to select is by defining your cooling needs. These days, most homes are already built with ductwork pre-installed. When this is the case, all you need to have for a home that gets entirely cooled is an HVAC unit and a thermostat system. For anybody wanting to cool a space bigger than a studio apartment, this is an excellent upgrade. This system not only adds value to your home, but its energy efficiency means that the cost of getting them installed now will be offset as time goes on. Before summer rolls around, the best thing for you to do is conduct a home cooling assessment with a technician. They can help you as you consider window AC units and HVAC options. While window AC units are great temporary solutions, in the long run, HVACs are the most cost-effective option. Not only are they energy efficient, but they also don’t block any windows or create any potential security hazards. HVAC systems also have the added benefit of heating your home in the winter, allowing your preferred home temperature all year round. ← What Is The Best Central Air Conditioner Brand and Why?